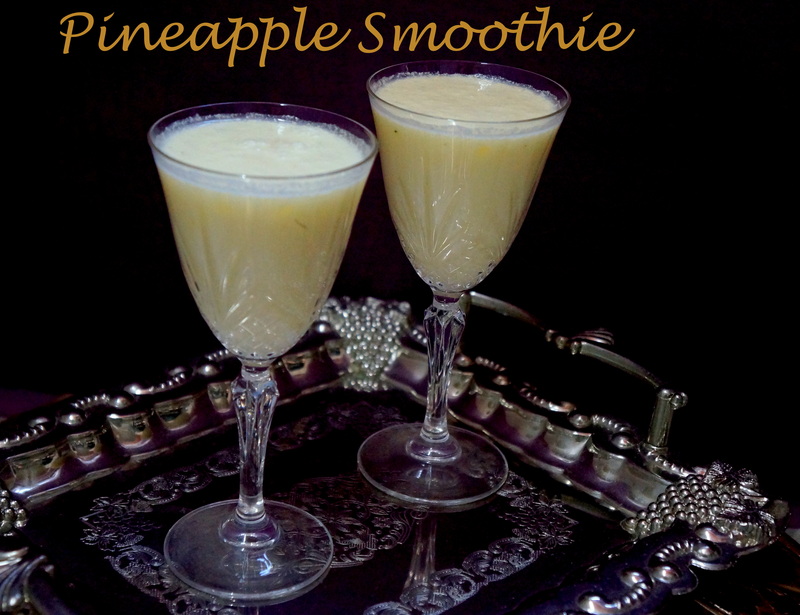 Pineapple is a delicious fruit..but not my brother’s favourite since he tends to develop an itchy tongue after consuming it..Here being the pineapple season,our house was literally overflowing with pineapples.So last time I made the very simple Pineapple juice,he refused to drink it 🙂 .So today I prepared this Pineapple Smoothie.He not only loved it,but also didnt get an itchy tongue.So I thought I must share this recipe so that it might be helpful or people facing similar difficulty,so that they can enjoy the goodness of this fruit in the form of this yummy and refreshing smoothie! Fresh Pineapple (skinned and chopped) – 1 1/2 cups. Powdered Cinnamon – 1 generous pinch. Chilled Milk – 1/2 cup. Honey – 1 1/2 tbsp. Chilled Yoghurt – 3/4 cup. In a blender,blend Pineapple pieces,Powdered Cinnamon,Chilled Milk,Honey and Chilled Yoghurt until smooth and uniform. Pour into tall glasses and Serve immediately!Enjoy! Use only chilled milk and Chilled yoghurt. Do not keep.Serve immediately after blending. You can reduce or increase the amount of honey,depending upon the sweetness of the Pineapple. This entry was posted in Uncategorized and tagged cinnamon, Drinks, Fruit recipes, honey, Kaithachakka, Pineapple, Pineapple itchy tongue, Pineapple Juice, Smoothies, yohurt. Recently I met one of my old classmates,now working in one of the leading fruit Jam companies in India..After a long talk over tea,I teased her asking why she didnt even bring me a sample bottle of Jam from her Company,she told me something that shocked me..!She said me that these store bought “Jams” or to be precise “Spreadable Fruit Servings” were not healthy at all!The so called “Fruit ” Jams contained very little fruit and more of sugar and corn starch and flavour enhancers.While you do need some sugar,its really the fruit you want to taste!..For a whole bottle of Jam,the quantity of fruit used was just 1 tbsp of fruit.Just imagine!And in addition to that ,the use of preservatives and some other artificial substances.I was shocked!I mean where is this world leading us to?? So after hearing all this,i spoke to my Mom about this..She was the one who told me..Why not make your own Jam instead of eating the Junk of the Store shelves!This recipe is from her kitchen. Pineapple was in season here,so I decided to make Pineapple Jam the very next day!It contains all the goodness of Pineapple with NO added colour and NO preservatives.It tastes wonderful and soo healthy!You can make your own labels for the bottles and gift them to your friends.This homemade jam makes a great gift!Do try it out! Lime Juice – 1 1/2 tbsp. Peel and chop the pineapple and puree it in a Blender. Heat a Saucepan over the fire,to this add the pineapple puree and sugar. Combine until the sugar is well dissolved and the mixture is thick for about 15 minutes,stirring.Place a small amount on a dry spoon and tilt the spoon,if it gels and doesnt flow,thats the consistency,its ready!If not,cook(Stirring) till this consistency is attained. Now turn off the flame,add the essence and lime juice and mix well. Allow to cool completely.Then transfer to a clean dry glass bottle and store and use! This jam keeps well for 2 weeks if used with clean dry spoons and is kept in a clean dry place.To use for longer period,store in refrigerator. 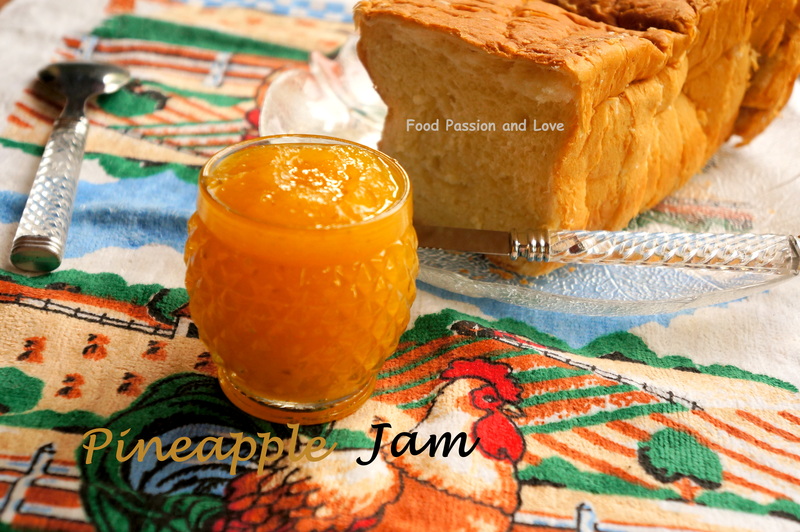 This entry was posted in Uncategorized and tagged easy recipes, Fruit, Fruit Jam, healthy recipes, How to make Jams, indian, Jam, kids special, Pineapple, spreads, without preservatives. This dish brings along with it a lot of memories of my childhood!When I did my schooling..just 3 years in kerala,staying with my grandparents..it brings a smile and also a tear on my face..a smile thinking about all that pampering and affection I used to get,being the first and only grandchild on both my maternal and paternal side(At that time 🙂 !Now I have a lot of cousins 🙂 ) and a tear thinking how much I miss my dearest GrandFather who passed away 3 years back..All those days spent with him..just feels like yesterday..How fast time flies!I remember the scene..years aback..the time when I came back from my school..our backyard would be buzzing with activity..lots of workers,bringing the harvest from the paddy fields..threshing,winnowing,the naadan pattu(Local folk songs)…etc..Nowadays there are machines which makes these processes a lot more easier with less labour..nothing like before 😦 So all these remain memories!We dont get to see them today. 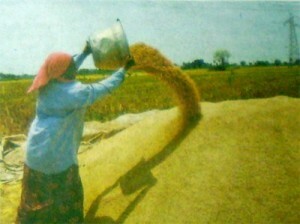 The staple food of these workers used to be Kappa Puzhungiyathu(Boiled Tapioca) with Kanthari Mulaku Chammanthi..Our chechi (Help) at home,I remember used to prepare it in big vessels for all the workers with her trademark “kanthai Mulaku Chammanthi”.I just loved watching them eat this dish…my mouth watering..and I used eat it sitting with them 🙂 I can never forget that taste..!The memory of it just leaves me salivating even today 🙂 So to relive those days,I prepared this today for tea!One thing I assure you..the smell and taste of the Kanthari mulaku chammathi will linger for long in your mouth hours after you have devoured it.The chammanthi(Chutney) is made out of fiery Kanthari Mulaku also called Birds eye chillies!These chillies may appear small,deceiving to the eyes,but they set your tongue literally on fire Mind You! So Try this very special dish for a sunny/rainy evening with a hot glass of Black Tea!! Water – as required to cook. Wash and clean the kappa.Remove the outer brown skin and the inner pink skin of the kappa/Tapioca. Cut into 2.5 inch pieces and wash well again.Now transfer these in a large vessel filled with water,the water level upto atleast 2.5 inches above the level of Tapioca. Add salt and cook covered till soft and tender.Then drain the water and keep aside. Curry leaves – a few. Coconut oil – 3 tbsp. Crush the chillies,curry leaves and the shallots in a pestle and Mortar.If you dont have one,you can coarsely grind them in your mixer. Transfer this to a small bowl,add coconut oil and salt.Mix gently. Serve immediately with hot Tapioca and a glass of hot Black Tea and Enjoy! 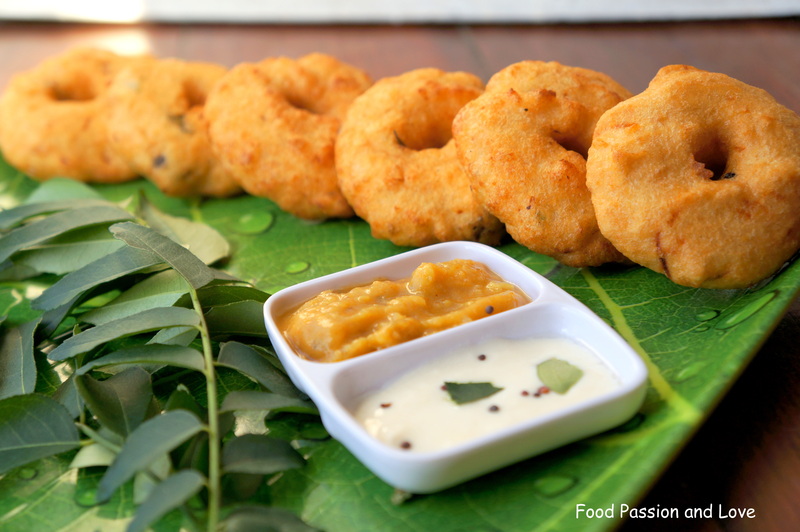 This entry was posted in Uncategorized and tagged Breakfast, Evening snack, Gods own country snack, Kappa, Kerala, Palaharam, Syrian Christian dishes, Tapioca. The initial years of our marraige are unforgettable..as it is for everybody 🙂 We spent them in Chennai..both of us working and evenings ususually spent at some malls,cinema and some time at the Elliot’s Beach,popularly known as the “Besant Nagar Beach”..still one of my very favourite places until today!There is some thing about that beach..something I have never experienced at any beaches before..Is it the cool gentle refreshing breeze cooling us after a busy day at work or the sounds of the bells at the church ringing reminding us that Mother Mary will be with us at every stages of our lives!..or the salt cleansing us or the setting sun embracing us with its warmth?If you are some one who loves the charm and allure of the Ocean,then I strongly recommend Besant Nagar Beach in Chennai!! 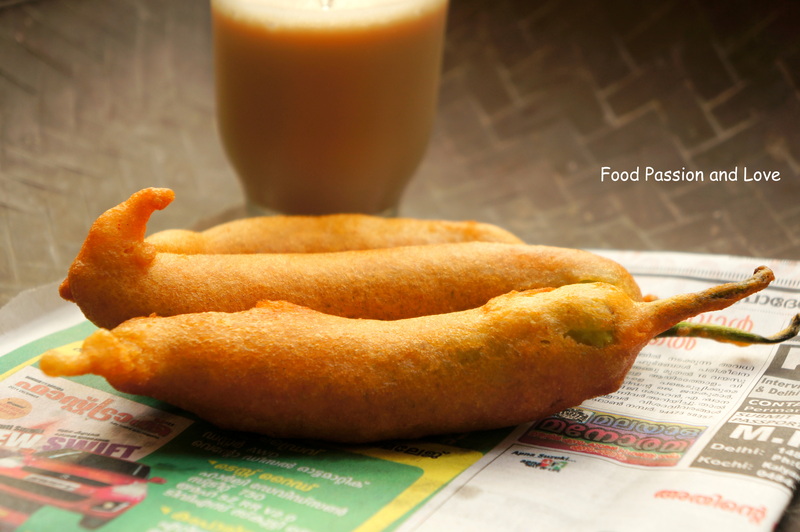 You must be wondering why I am talking about Besant nagar Beach when My post today is about Mulaku Bajji 🙂 Well..this is the place where I got introduced to this fried fritters.This is one of the most popular tea time snack in South India.It is prepared by deep frying the batter coated Banana Peppers. When we set foot on this beach,we are welcomed by the distinctive aroma of deep fried bell peppers..ahh..so heavenly.So today evening I decided to give a try to prepare this delicious fritters for tea and here it is! 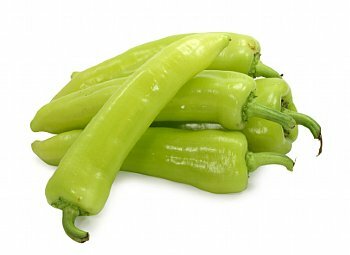 Banana peppers/Bajji mulaku – 6 -8 nos. 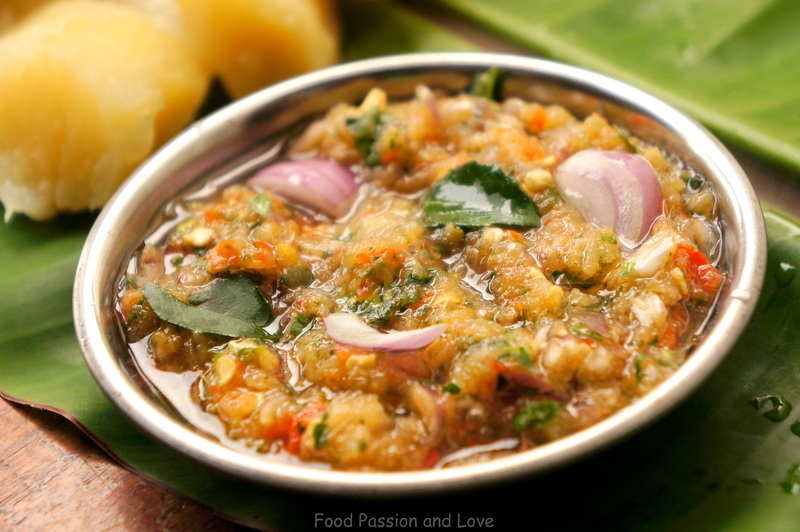 Gram Flour/Kadala Mavu – 1 cup. Rice Flour – 2 1/2 tbsp. 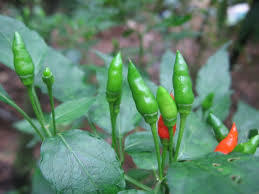 Chilli Powder – 1 tsp. In a bowl ,combine all the ingredients,except the Banana peppers,and make a thick batter. Carefully make a slit,lenghthwise on the banana pepper and remove the seeds.This step is optional.If you want a spicier bajji ,do not discard the seeds. Heat oil in a pan to deep fry.turn the flame to medium.Now dip the banana peppers/Bajji Mulaku deeply in the batter and deep fry until golden colour all over and till crisp. Transfer to a plate and drain on a kitchen towel to remove the excess oil and serve hot with a cup of hot tea and Enjoy!! 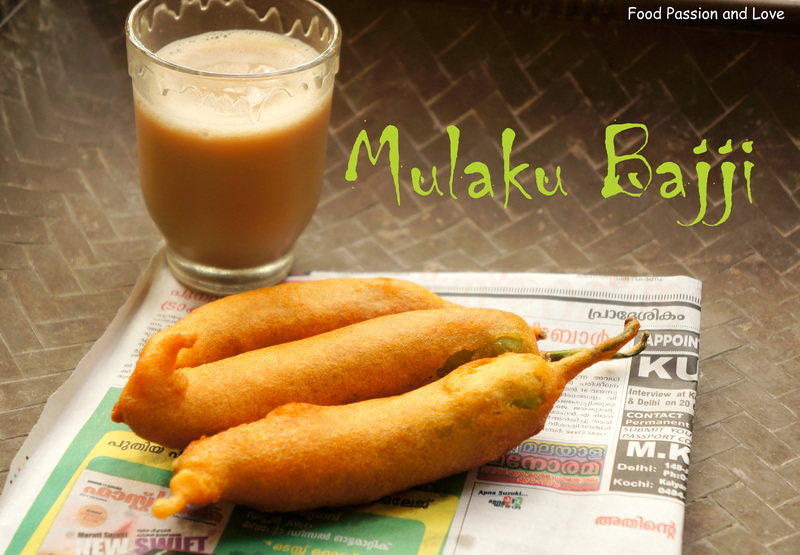 This entry was posted in Uncategorized and tagged Besan, Chayakada snacks, Chennai snacks, chickpea Flour, Evening snacks, Kerala, Kerala Snacks, Mulaku, Mulaku Bajji, snacks, Tea time snacks, Vegan, vegetarian. 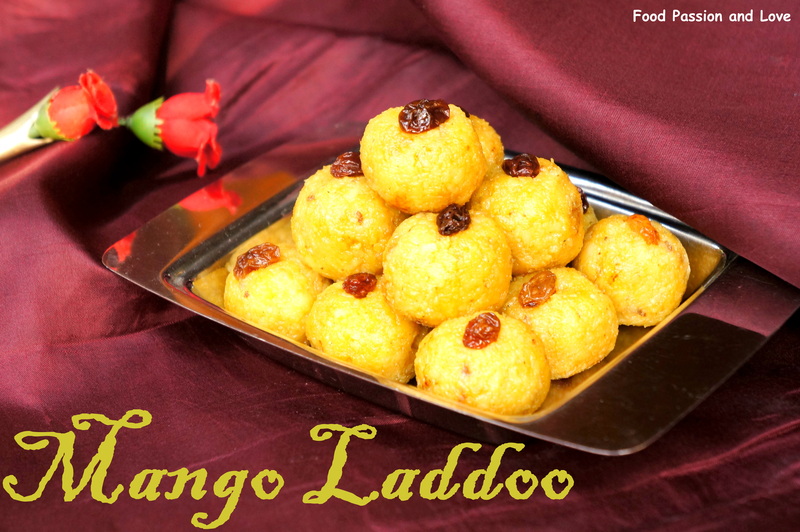 I know there are many mango lovers out there!Aren’t you one?Well..I am one.And when Mangoes are not in season and a mango lover like me gets desperate..!This post is the result of that.I made these very simple,delightful and addictive Mango Laddoos,using tinned Mangoes.But you can use fresh mangoes too.They can be prepared in a jiffy.Give it a try dear friends!You will love them! 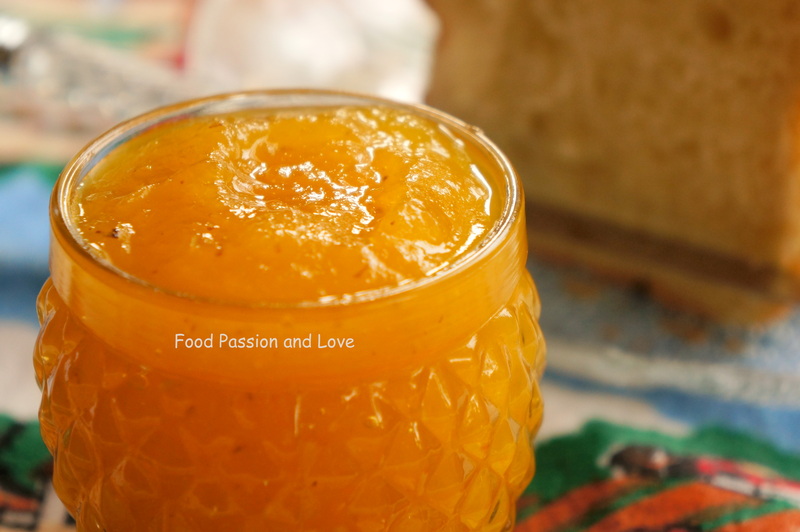 Mango Puree – 1 cup. Freshly grated coconut – 2 1/8 cup. Condensed milk – 1/4 cup. Cardamom powder – 2 generous pinch. Cashewnuts,roasted in ghee and chopped into tiny bits – 1/8 cup. Heat a pan on medium heat and roast the coconut until it turns dry,but not browned and the raw aroma disappears. To this add the mango puree and keep on stirring with a wooden spoon until the mixture is dry and the moisture starts to dry up.Now add the cardamom powder and combine well . Add in the chopped cashewnuts at this stage and mix well and turn off the flame. 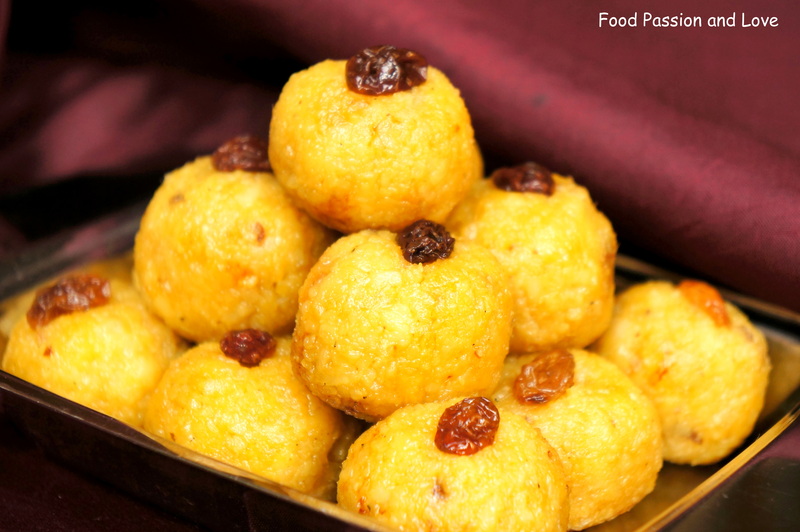 Make small balls/laddoos while the mixture is warm (not hot), but do not allow to cool. Press a raisin on the top and serve when cold and Enjoy! You can use dessicated coconut too,instead of the freshly grated coconut and can reduce the stirring 🙂 I didnt have dessicated coconut,so I used freshly grated coconut,roasted it a bit(not until browned) to get a dessicated coconut texture. This entry was posted in Uncategorized and tagged dessert recipes, diwali recipes, indian, indian recipes, laddoo, mango recipes, snacks, sweet dishes. This is one of my family’s very loved dish..except that paneer is not easily available here.But whenever it comes in the stores,I never miss a chance to make this dish.This is a commonly loved favourite among many..One of my dear friends,she asked me not to let out her name..so let me call her S 🙂 has been asking me the recipe of Paneer Butter Masala..So “S”..here it is..!I have kept my word! I learnt this dish from my punjabi neighbours..again I am thankful to them for that.I prepare this dish during the Lent season(Before Easter) too,when we avoid Non veg.Another of my favourite dish almos similar to this is Butter Chicken ,which you can go through in my Blog. 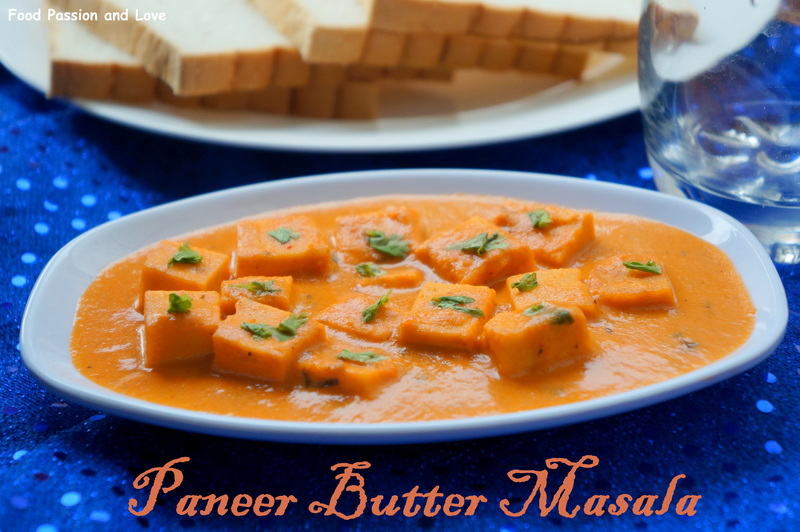 Do try out this very easy,restaurant style Paneer Butter Masala. Kashmiri Chilli powder – 1tsp. Heat the butter in a pan and add the minced onions. Saute till Golden brown. Add the gingergarlic paste, corianderpowder, chilli powder, turmericpowder, and salt. 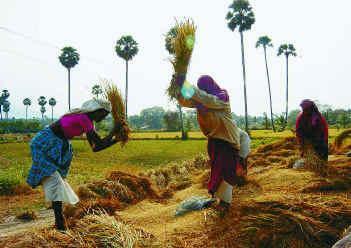 Saute till it emits an aroma. Now add the pureed tomato and tomato sauce and cook for 3-4 minutes. Add the kasuri methi, milk, and the cubed Paneer/Cottage cheese. Cook covered for 3-4 mins until soft. Mix occasionally. Keep the flame low. When the paneer is cooked soft, open the lid .If the gravy is too thick, add some water at this stage. When done, add the garam masala and the cream or cashew paste.Mix well(take care not to boil). Check salt,add if needed, garnish with the coriander leaves, and put out the flame. 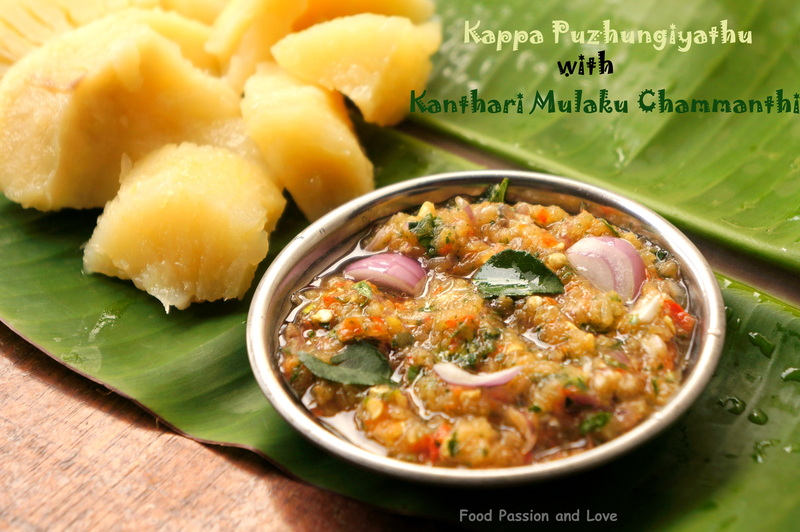 Serve hot with naan or bread and Enjoy!! 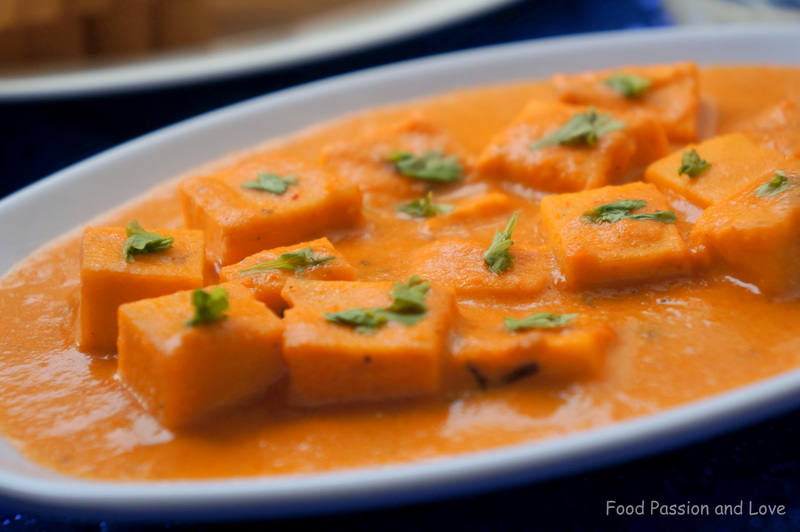 This entry was posted in Uncategorized and tagged Chapathi side dish, Cottage cheese, curry recipes, dhaba style paneer butter masala, easy recipes, Naan Side dish, Paneer, Paneer recipes, punjabi dishes, Vegetarian dishes. Long time friends…. !Its been a long while since I posted anything on my Blog..Sometimes life and our dear ones keeps us soo busy..we dont get time for any thing..
Today my post is of a simple and very easy Uzhunnu Vada,a typical of the Kerala naadan chaya kadas(Tea stalls)..Deep inside of every Malayali,an evening is perfect with a cup of tea and choodu(hot) Uzhunnu Vada..I have been making this for the past 5 years..This is a very easy recipe even for a beginner and it makes perfect Vadas.Try it out! Onion chopped – 1/4 cups. Green chillies – 2 chopped finely. Curry leaves – 2 sprigs. Ginger – 1 inch piece(finely chopped). Soak Black Gram Dal/Urad dal in water for about 1 hour. Drain the water away after 1 hour and grind in a grinder,without adding water,until you get a fluffy and thick paste.Incase your grinder doesnt grind well,sprinkle a little water and grind to get a batter as thick as possible. Now transfer this batter to a bowl and stir with a spoon just once.To this batter,addRice flour and mix well with spoon to avoid any lumps.Then add chopped onion,green chillies,Whole Black pepper corns,curry leaves,chopped ginger,Baking soda and salt and mix well. Wet the palms of your hand and Take a little batter(half a hand full) in your palm,make into a round ball shape,gently flatten it,make a hole with one finger and gently drop it into the oil with care.Remember to wet your palm each time you flatten the batter in your palms. Fry till golden brown on both sides,alternating the flame from high to medium. Drain the excess oil on a kitchen towel.Serve hot with Sambar and Chutney and a hot cup of Coffee/Tea and Enjoy! Adding Rice flour makes the Vadas/Fritters crispy. You can add grated carrot to the batter to make it nutritious. 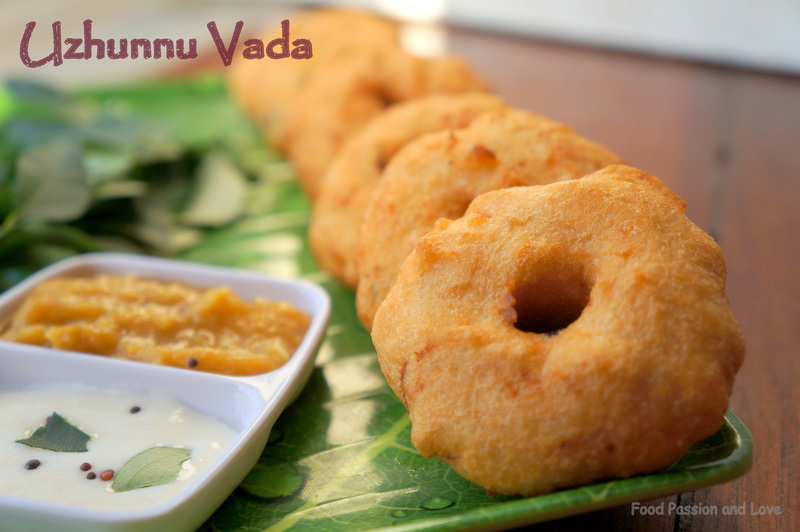 This entry was posted in Uncategorized and tagged easy snack recipes, Evening snacks, Kerala snack recipes, Kerala style Uzhunnu Vada, Medu Vada, Naadan Snacks.